↑ "The Foundation and Its History". waksman-foundation.org (No further authorship information available). สืบค้นเมื่อ January 11, 2007. ↑ "Selman A. Waksman - Biographical". Nobelprize.org. สืบค้นเมื่อ 20 November 2016. ↑ SA Waksman (1947). "What Is an Antibiotic or an Antibiotic Substance?". Mycologia. 39 (5): 565–569. doi:10.2307/3755196. JSTOR 3755196. PMID 20264541. ↑ "The Nobel Prize in Physiology or Medicine 1952". Nobelprize.org. สืบค้นเมื่อ 20 November 2016. ↑ Pringle, Peter (June 11, 2012). "Notebooks Shed Light on a Discovery, and a Mentor's Betrayal". The New York Times. สืบค้นเมื่อ June 11, 2012. ↑ "The Schatz v. Waksman Lawsuit – 1950". scc.rutgers.edu. ↑ Veronique Mistiaen (2 November 2002). "Time, and the great healer". The Guardian. สืบค้นเมื่อ 17 August 2013. ↑ "Dr. Schatz Wins 3% of Royalty; Named Co-Finder of Streptomycin; Key Figures in Streptomycin Discovery Suit". New York Times. 30 December 1950. สืบค้นเมื่อ 17 August 2013. ↑ "Selman Abraham Waksman". Encyclopedia.com. สืบค้นเมื่อ 20 November 2016. ↑ "Selman A. Waksman". NNDB.com. สืบค้นเมื่อ 20 November 2016. 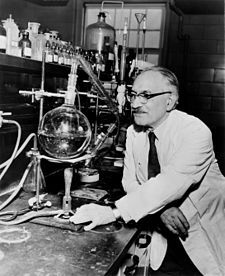 "Selman Waksman and Antibiotics". American Chemical Society. หน้านี้แก้ไขล่าสุดเมื่อวันที่ 23 กันยายน 2561 เวลา 23:10 น.